An original letter of correspondence between brothers and business partners Joshua Coffin Chase and Sydney Octavius Chase. Topics discussed in the letter include the implementation of Sydney's picking instructions, Joshua's trip around Isleworth Grove, the waste from oranges around Lake Laura, and the high quality of pineapples for the season. 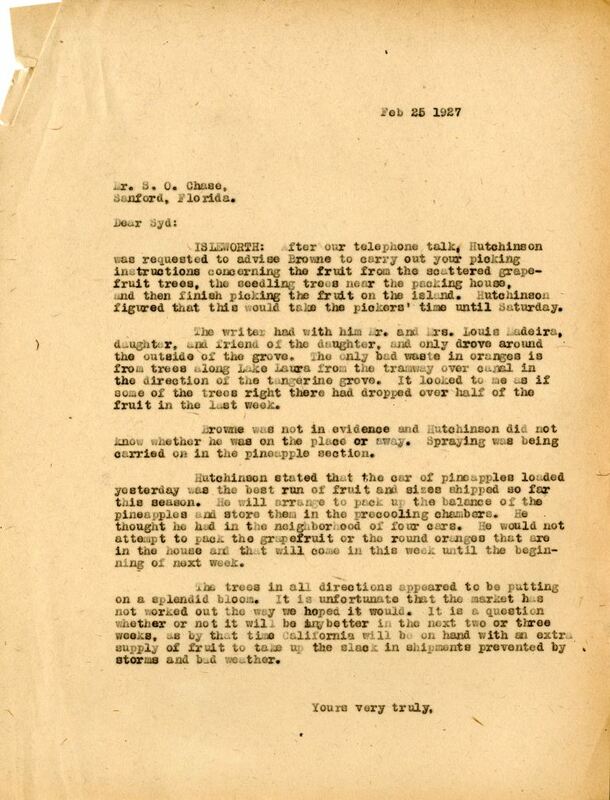 Original letter from Joshua Coffin Chase to Sydney Octavius Chase, February 25, 1927: box 49, folder 20.84, Chase Collection (MS 14), Special and Area Studies Collections, George A. Smathers Libraries, University of Florida, Gainesville, Florida. Digital reproduction of original letter from Joshua Coffin Chase to Sydney Octavius Chase, February 25, 1927. ISLEWORTH: After our telephone talk, Hutchinson was requested to advise Browne to carry out your picking instructions concerning the fruit from the scattered grapefruit trees, the seeding trees near the packing house, and then finish picking the fruit on the island. Hutchinson figured that this would take the pickers' time until Saturday. The writer had with him Mr. and Mrs. Louis Madeira, daughter, and friend of the daughter, and only drove around the outside of the grove. The only bad waste in oranges is from trees along Lake Laura from the tramway over canal in the direction of the tangerine grove. It looked to me as if some of the trees right there had dropped over half of the fruit in the last week. Browne was not in evidence and Hutchinson did not know whether he was on the place or away. Spraying was being carried on in the pineapple section. Hutchinson stated that the car of pineapples loaded yesterday was the best run of fruit and sizes shipped so far this season. He will arrange to pack up the balance of the pineapples and store them in the precooling chambers. He thought he had in the neighborhood of four cars. He would not attempt to pack the grapefruit or the round oranges that are in the house and that will come in this week until the beginning of next week. The trees in all directions appeared to be putting on a splendid bloom. It is unfortunate that the market has not worked out the way we hoped it would. It is a question whether or not it will be any better in the next two or three weeks, as by that time California will be on hand with an extra supply of fruit to take up the slack in shipments prevented by storms and bad weather. Chase, Joshua Coffin. 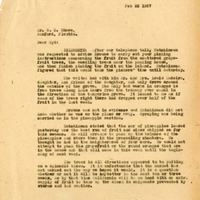 “Letter from Joshua Coffin Chase to Sydney Octavius Chase (February 25, 1927).” RICHES of Central Florida accessed April 20, 2019, https://richesmi.cah.ucf.edu/omeka/items/show/2715.